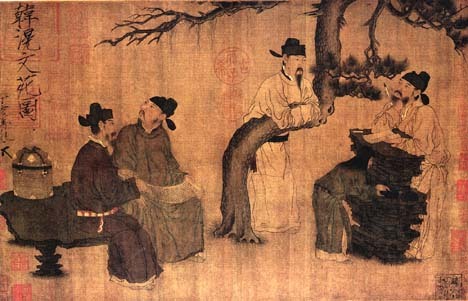 The leisure activities of the literati class are well-represented in paintings of the Song and Yuan periods; one of the most common of these being the gathering of officials and others of literary talent in a garden setting for the pleasures of reading, composing poetry, and appreciating works of art and antiquities. SOURCE: Jin Weinuo, ed., Zhongguo meishu quanji, huihua bian 2: Sui Tang Wudai de huihua yishu (Beijing: Wenwu chubanshe, 1984), pl. 63, pp. 124. Collection of the National Palace Museum, Beijing. Handscroll, ink and colors on silk, 30.4 x 58.5 cm. 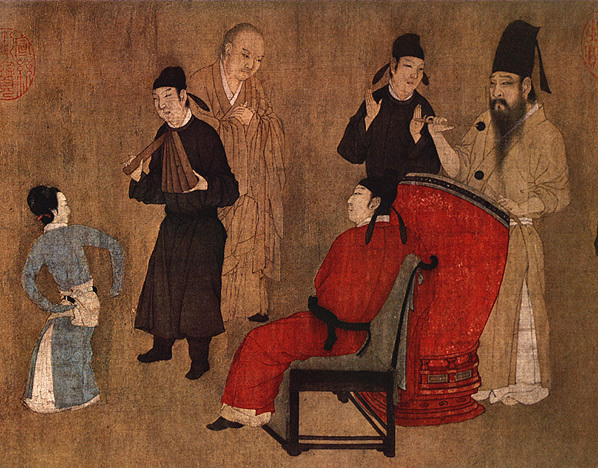 Figure painting during the Song carried on the achievements of Tang representations of the human subject, which had reached a high level of skill in the portrayal of individual psychologies and the nuances of the given narrative. 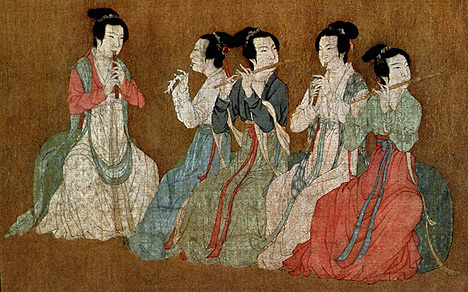 Below is a superb example of figure painting from the early Song period, The Night Revels of the Minister Han Xizai. As you look at the whole painting provided in two sections below, try to determine what kind of story or event is being portrayed. Figures that appear to be repeated throughout the length of the scroll represent the same figure in different scenes of the narrative. As with all handscrolls, the story progresses sequentially from the right end of the painting, and would be viewed only in sections. Where do you think these breaks might logically occur? How does the artist make use of furniture to organize the space of the picture? 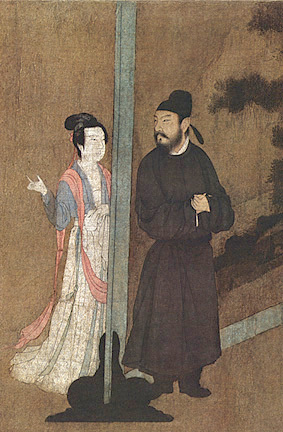 In most figure paintings in China, it is relatively rare to see men and women juxtaposed so closely in a private interior setting. Judging from the physical proximity, demeanor and facial expressions of the individuals in the detail below, what kind of event or situation do you think the artist was trying to portray? Are the individual personalities evident, and how does the artist communicate them? Through details of clothing and hairstyle? Behavior? Body language? What does this detail tell us about the way people of the elite class entertained? 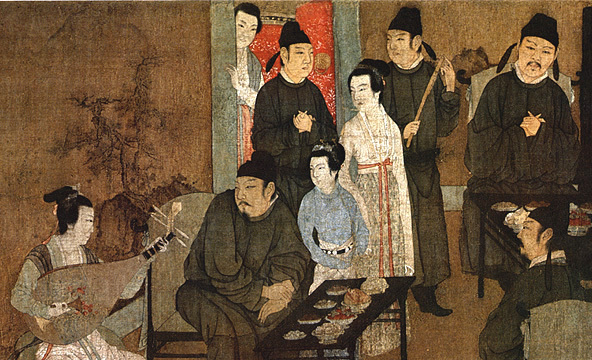 SOME COMMENTS: The Night Revels of Minister Han Xizai is believed to have originally been painted by the Southern Tang artist Gu Hongzhong for the emperor Li Yu of that dynasty. Its purpose was to admonish one of the leading ministers, Han Xizai, who, though an able official, was nevertheless recalcitrant in his duties, failing to appear on several occasions for his early morning audiences with the emperor. It got to be common knowledge that this was due to an excess of revelry with singsong girls and banquets held in his own private apartments. The emperor, seeking to shame the wayward minister into exhibiting greater decorum, assigned a painter to attend the night-long parties as a secret informant, and to afterwards recreate on silk the untoward behavior he had witnessed among the officials present. 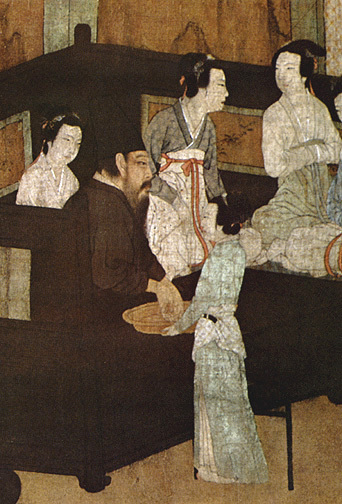 It is said that Minister Han Xizai, after being confronted with his misdeeds recorded in detail in the painting, disregarded this tactful reprimand and continued his escapades up until the fall of the Southern Tang to Song forces. In the details below and elsewhere on this page, how would you characterize the differences in physical demeanor of men and women as they communicate with others? Do the men have a more uniform appearance throughout the painting, and what might account for this? SOURCE: Zhongguo lidai huihua: Gugong bowuyuan canghua ji, vol. 1 (Beijing: Renmin meishu chubanshe, 1978), p. 90. Collection of the National Palace Museum, Beijing. SOURCE: Zhongguo lidai huihua: Gugong bowuyuan canghua ji, vol. 1 (Beijing: Renmin meishu chubanshe, 1978), p. 93. Is there a difference in appearance among individual women in the painting? Do the musicians below seem to have a different mode of dress or hairstyle than other female companions? SOURCE: Zhongguo lidai huihua: Gugong bowuyuan canghua ji, vol. 1 (Beijing: Renmin meishu chubanshe, 1978), p. 91. Collection of the National Palace Museum, Beijing. Does the setting in this scene imply anything about the type of interaction or what might be communicated between these individuals? Judging from manner of dress and level of participation in the activity depicted below, what differences can you discern in social status among the men in this scene? Compare the female figures in the details below. What do their postures and body language communicate about their attitude toward their surroundings or the people they are interacting with? SOURCE: Zhongguo lidai huihua: Gugong bowuyuan canghua ji, vol. 1 (Beijing: Renmin meishu chubanshe, 1978), p. 93. 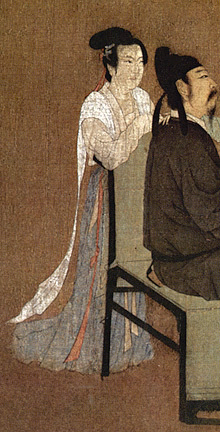 Detail of handscroll (final scene), ink and colors on silk, 28.7 x 335.5 cm Zhongguo lidai huihua: Gugong bowuyuan canghua ji, vol. 1 (Beijing: Renmin meishu chubanshe, 1978), p. 93.